DELAWARE, Ohio – The Gillespie Honors House, Ohio Wesleyan University’s newest student residence, houses 27 students – and endless educational opportunities – in its spacious 6,934 square feet. Ohio Wesleyan alumni Robert W. Gillespie and his wife, Ann L. Wible Gillespie, of Gates Mills, Ohio, funded construction of the $2 million building. The Gillespie Honors House, 81 Oak Hill Ave., opened in August and will be dedicated at 5 p.m. Oct. 19 as part of Ohio Wesleyan’s 2017 Homecoming and Family Weekend, which will include a kickoff celebration for the university’s Connect Today, Create Tomorrow fundraising campaign. Ann Gillespie, a 1967 Ohio Wesleyan graduate, said the university has given a lot to the couple, and they are honored to be able to give back. The Gillespie Honors House is home to sophomores, juniors, and seniors who are part of the university’s Leland F. and Helen Schubert Honors Program. Student Cindy Huynh, a junior from West Chester, Ohio, is the moderator of the Gillespie Honors House. In that role, she is working with her housemates and the Student Honors Board to create educational events to host at the new residence. “The Gillespie Honors House provides a space to foster a community of students with bright minds who are passionate about learning,” said Huynh, a genetics and pre-medicine double-major and a chemistry and sociology double-minor. “It is a study and living-learning area for students who are dedicated to their academic goals and aspirations. Ohio Wesleyan President Rock Jones said the Gillespie Honors House creates limitless opportunity for OWU students. 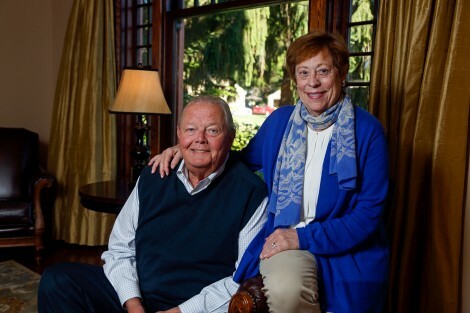 “I am very grateful to Bob and Ann Gillespie for this visionary gift,” said Jones, Ph.D. “Their philanthropic foresight and investment help further distinguish Ohio Wesleyan as an institution that recognizes and cultivates academic excellence. During their time as Ohio Wesleyan students, Ann Wible studied music and elementary education, earning a Bachelor of Music degree. She was a member of the Mu Phi Epsilon International Professional Music Fraternity and the Pi Beta Phi Fraternity for Women. She also was a senior adviser and performed with the Wesleyan Players, A Capella Choir, and Madrigal Singers. She later taught voice at the Cleveland School of the Arts. Her father, David A. Wible, Class of 1939; aunt, Josephine Wible Millican, Class of 1927; and brother, David F. Wible, Class of 1974, also are OWU alumni. While at Ohio Wesleyan, Robert Gillespie majored in economics and served as president of the Epsilon chapter of his fraternity, Alpha Sigma Phi. He also was involved with the Le Bijou Yearbook. After earning his OWU Bachelor of Arts degree, he went on to earn his Master of Business Administration degree from Case Western Reserve University in Cleveland and, later, to complete the Advanced Management Program at Harvard Business School. Gillespie spent his career in Cleveland’s banking industry, including serving as president of Society Corp. and guiding the institution from a $3 billion enterprise to a $120 billion operation. Later, in roles as chairman, president, and chief executive officer, Gillespie helped KeyCorp, which merged with Society, to evolve from a collection of local banks into a national multi-line provider of integrated financial services. He remains KeyCorp’s chairman emeritus. Throughout their lives, the Gillespies have remained strongly connected to Ohio Wesleyan. Robert Gillespie is a Life Trustee of the university and currently serves on the board’s University Advancement, Finance and Operations, and Investments committees. He also has been active with the Department of Economics and with The Woltemade Center for Economics, Business and Entrepreneurship. The couple’s latest gift not only funded the full construction of the Gillespie Honors House, but also commemorated their recent class reunions, with an additional $500,000 supporting the Ann Wible Gillespie Endowed Scholarship, the Jack Dawson Scholarship, and the Ohio Wesleyan Fund, an unrestricted account that supports campus operations, including student scholarships, faculty development, and building improvements. Their $2.5 million gift is part of Ohio Wesleyan’s $200 million Connect Today, Create Tomorrow campaign – the largest single fundraising initiative in university history. The seven-year campaign launched its leadership phase in July 2014, and will launch its public phase Oct. 20. Campaign priorities include enhancing access and affordability for students through scholarship endowment; recognizing and rewarding faculty excellence and innovation; and improving the physical campus. To learn more about Ohio Wesleyan’s Honors Program, visit www.owu.edu/honors. To learn more about the Connect Today, Create Tomorrow capital campaign, or make a gift to the university, visit www.owu.edu/give. Founded in 1842, Ohio Wesleyan University is one of the nation’s premier liberal arts universities. Located in Delaware, Ohio, the private university offers more than 90 undergraduate majors and competes in 23 NCAA Division III varsity sports. Through Ohio Wesleyan’s signature OWU Connection program, students integrate knowledge across disciplines, build a diverse and global perspective, and apply their knowledge in real-world settings. Ohio Wesleyan is featured in the book “Colleges That Change Lives,” listed on the latest President’s Higher Education Community Service Honor Roll with Distinction, and included in the U.S. News & World Report and Princeton Review “best colleges” lists. Learn more at www.owu.edu.